The 19th century Kimmel Brewery stands as an island within the residential realm of the city’s urban expansion. Transformation of this iconic Riga Quarter recreates the city’s unique spatial quality through a modern interpretation of the historical Riga industrial city-block. A synthesis of old and new forms deliver a harmonious complex that reflect and enrich the unique character and silhouettes of the city’s distinct identity. The quarter invites the city in, offering new and unique spaces and experiences, while respectfully preserving the cultural and historical integrity of the brewery and its past. The New Kimmel Quarter is a place for residents and visitors, for brunches and for drinks. This is an integral part of the city, offering exciting new experiences and limitless opportunities. The Kimmel site frames Riga’s Art Nouveau area and connects with other typologies of Rigan city blocks. The strict Riga centre block structure codes strong perimeter along the street. Kr. Valdemara street profile is quite strict and well defined, yet moving from the Old town towards East Province of Riga it becomes more fluid and more elastic. It tells city’s growth story - from very dense city centre to lower density where industrial, more flexible structures were build. Our design incorporates this evolution of Kr. Valdemara street perimeter. The new Kimmel City complex continues to have both street profiles - the strict and elastic one. This approach continues the evolution story of the city islands. The Kimmel site frames Riga’s Art Nouveau area and connects with other typologies of Riga city blocks. 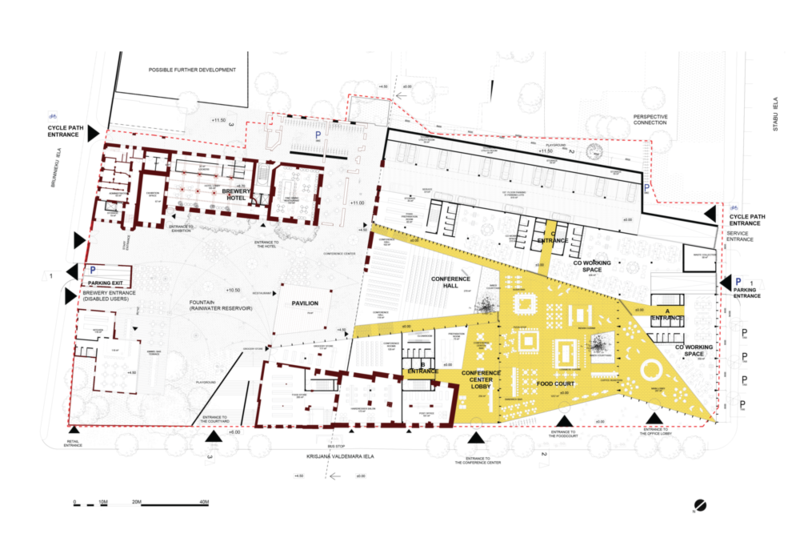 The heritage buildings of the quarter play most important role and are carefully incorporated into new design. The historical courtyard is recreated and transformed into public square. The historical streetscape of Kr. Valdemāra Street is subtly opened to the quarter and supplemented with the corner building in the West. The rich corner perspectives and silhouettes from Kr. Valdemāra Street are maintained. The Brewery Chimney, The Wall along Kr. Valdemāra Street and the Brewery building are restored with great caution. The new building volumes brings to light historical perspectives. 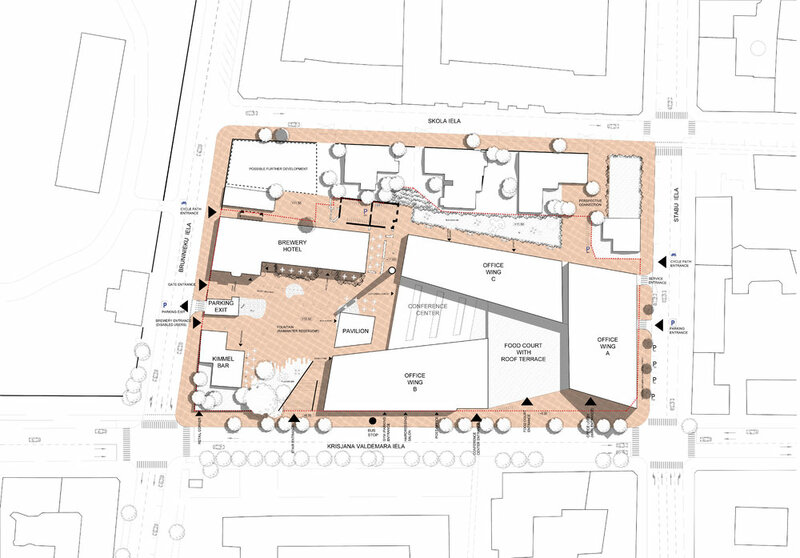 The site layout maintains and continues the characteristic “urban island” composition, while forming two semi-enclosed courtyards - historical and new. The Historical Courtyard is surrounded by heritage buildings, while The New one is defined by a perimeter of modern office buildings. The complex opens up to Kr. Valdemāra Street with main entrances to the office buildings, foodcourt, and conference centre, entrances to retail stores and underground parking, as well as entrances to the Historical Courtyard. 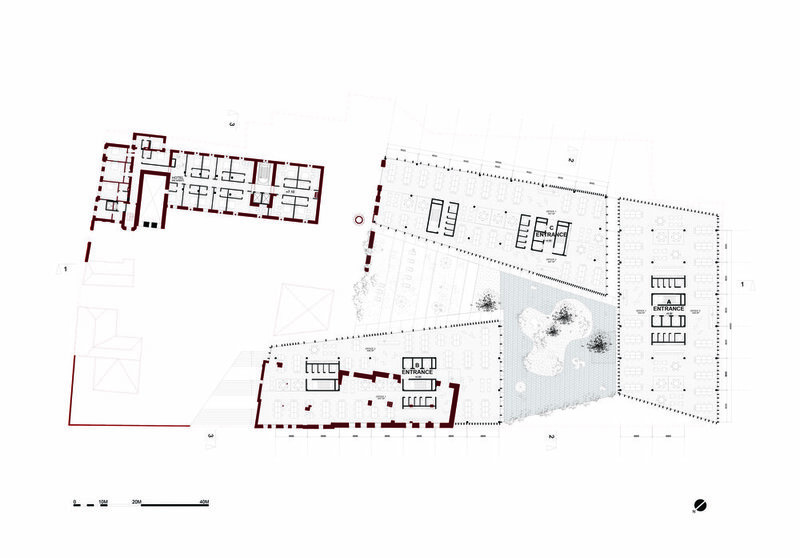 The concept aims to recreate the city’s unique spatial quality through a modern interpretation of the historical Rigan industrial city-block typology. Relationship of the street and the site is changed - the wall limiting the plot becomes the connection point between the two. The courtyards are designed to open up and attract passersby as well as a space to mingle for city dwellers and office employees. Historical Courtyard - Kimmel Beer garden is surrounded by reconstructed Kimmel brewery building, former Kimmel production building along Kr. Valdemāra Street, former wooden residential house with garden, former residential house along Bruņinieku Street and the chimney of the Kimmel brewery. New Courtyard - Kimmel Foodcourt is surrounded by three office buildings which are organized to remain the multi-silhouette vista to Kimmel brewery and chimney from Kr. Valdemāra Street and Hanzas/Stabu Street junction. 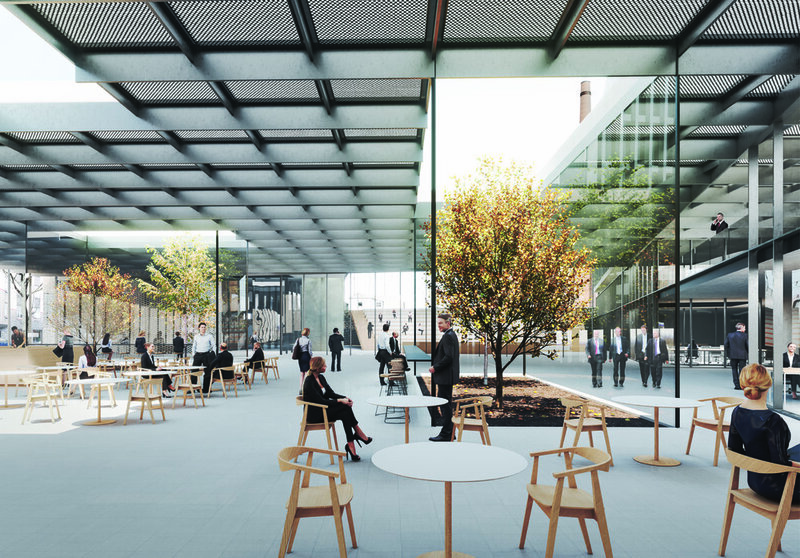 The new office buildings form inner foodcourt space with good connections to the streets, Historical Courtyard and main entrances to the offices.